first up, the 1¢ on far left is the Bottle Gentian (Gentiana andrewsii), a perennial herb that grows from one to two feet high. It is a rare flower and only found in damp meadows in Quebec, Ontario and Manitoba. the 2¢ is an Western Columbine (Aquilegia formosa) is found in western Alberta and British Columbia. It is also a perennial herb found in damp meadows and woodland clearings. It attracts butterflies and hummingbirds. 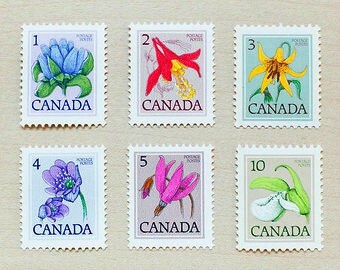 on the 3¢ is the Canada Lily (Lilium canadense), another damp meadow lover that blooms in eastern Canada. It usually grows between two and five feet high and can have up to twenty flowers. on the bottom row, we have the 4¢ Hepatica (Hepatica acutiloba), sometimes known as the liverleaf, because it was once thought to be useful for healing liver ailments. It is fond of limy soil from the Maritimes to Manitoba. the 5¢ shows a Shooting Star (Dodecatheon hendersonii) which grows from five to eighteen inches tall in woods, mountains and prairies in western Canada. and, finally there is the Sparrow's Egg Lady's Slipper (Cypripedium passerinum) on the 10¢ stamp. This is one of the few orchids that blooms in the Arctic and can be found from Quebec to Yukon. A lovely set - thanks for adding all the details about each one. I will admit, that none of these were familiar to me! ...good to see you back, happy spring. I love the simple designs. They must look very nice on postcards. I find I prefer these simple designs, too. I have four of these but the 5c is nearer red than pink - is it the effect of the scanner do you think? my photo ended up a bit overexposed, so i deepened the colour a bit. it is meant to be pink. I enjoyed looking at each stamp and reading the corresponding details. Those are just beautiful. I just planted some hepatica today!